Hassan Kadam (Manish Dayal) learned the art of cooking as a child from his mother. He would hang out with her in the kitchen of their family’s restaurant in India. When the family is forced to flee, Papa (Om Puri) takes the family to Europe. While traveling through France, looking for a place to settle down, the family is rescued by Marguerite (Charlotte Le Bon). Seeing it as a sign, Papa decides the small town is the perfect place to open a restaurant serving Indian food. In France. When Papa and the family open Maison Mumbai, their over-the-top restaurant, to say Madame Mallory (Helen Mirren) is upset is an understatement. Madame Mallory owns Le Saule Pleureur, one of the finest restaurants in France. It is so well-known, the president dines there. Her restaurant is directly across the street from where the Kadams have opened their eatery. An immediate rivalry develops between Papa and Madame Mallory. To make things more complicated, Marguerite is a sous chef at Le Saule Pleureur, putting a strain on the attraction between her and Hassan. 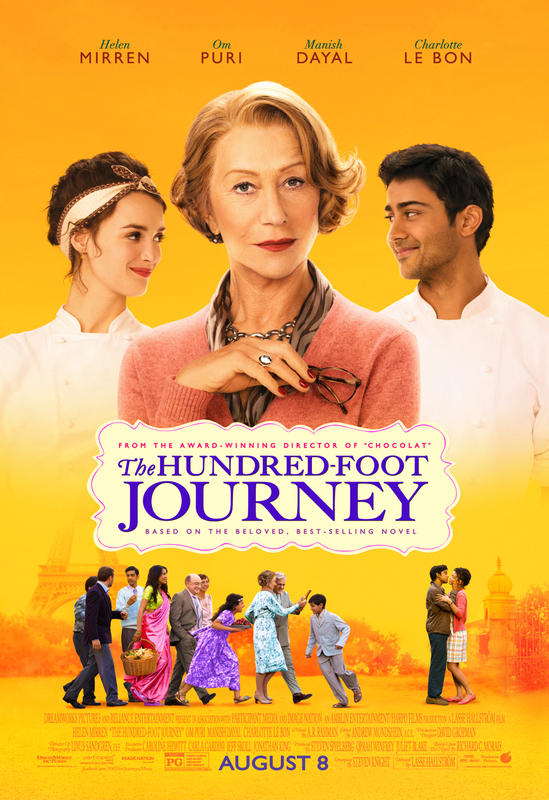 The Hundred-Foot Journey describes the walk from the Maison Mumbai to Le Saule Pleureur. It is a journey those on both sides take many times, going from the comforts of familiarity to the threat of the unknown. Only through making this short, yet difficult journey, can you find a place of tolerance and acceptance. The film takes the culinary aspects of Chef and mixes it with the cultural charm of The Best Exotic Marigold Hotel. While I didn’t find myself leaving the theater hungry, as I did with Chef, the cooking shots were very well done. Helen Mirren can do no wrong with any film she is in. She instantly takes things up a level with her talent. Om Puri definitely wins in the comedic parts of the film. His portrayal of Papa, while maybe being a little stereotypical, is a bit of a scene stealer. I didn’t quite feel the chemistry between Hassan and Marguerite that the filmmakers were hoping for, but they did well, nonetheless. The ending of the film left me a bit unsatisfied. It’s almost as if the director did a time check and said, “We’re at the 2 hour mark? Ok, let’s wrap this thing up.” With that, they took the final 2 minutes of the film tying everything up with a tidy little bow. It was a little hurried, but it doesn’t take away from the overall success of the movie. I just wish I could have left with a better taste in my mouth. The Hundred-Foot Journey doesn’t try to hide its message of tolerance and acceptance.Thankfully, it never gets overly preachy or heavy-handed delivering that message. This is a movie that your mom would almost definitely love. Take her to see this one on a movie night with mom. She deserves it.